Way back last year (a month ago!) 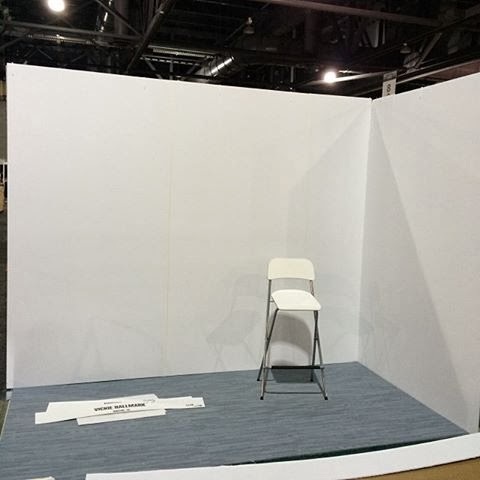 I posted my design ideas for my booth at the Buyers Market of American Craft, and then I went silent as the number of details to take care of, coupled with the holidays, just overwhelmed any capacity to blog on my part. Today I thought I'd catch my breath after attending the BMAC last week and show you what I actually implemented. 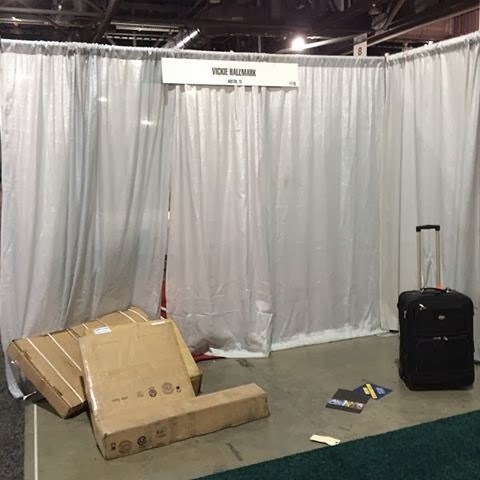 Most buyers probably have no idea what the exhibitor goes through to be ready for that opening event. Here's how it all begins. I shipped four packages to the advance warehouse, which were transported over to my booth on the first day of set up. This is an expensive proposition, as not only must I pay shipping (Fed Ex Ground going in), but drayage is assessed. Drayage is the most expensive form of shipping your work the shortest distance. For example, drayage to move the boxes a few miles from the warehouse to the convention center cost half as much as moving it all the way from Texas to Philadelphia. The booth rental itself includes a plot of floor, in my case 5'x10' in size on a corner, and the standard issue "pipe and drape." Flooring is required, at my expense, and any furniture must either be provided by me or rented at essentially purchase price. 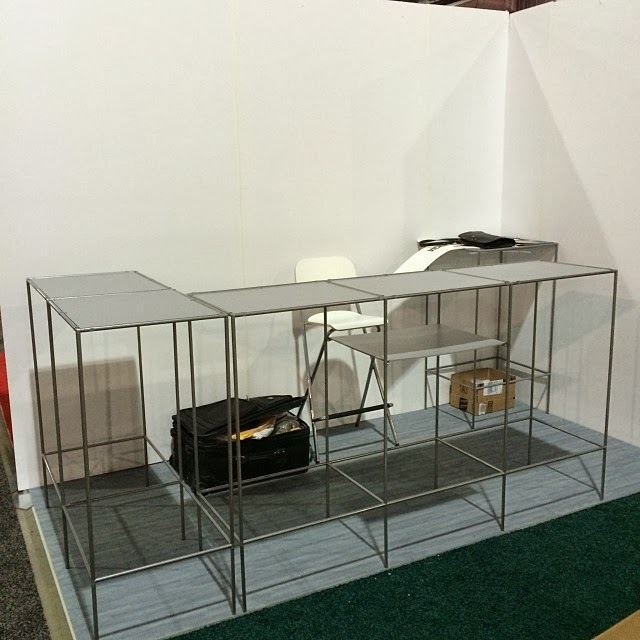 I decided that since I was doing more than one trade show, purchasing my own fixtures would be ultimately cost effective considering the rental rates. I chose to have large 4'x8' foam core sheets delivered from a nearby art store, which were hung from the pipe with zip ties and taped together to give this seamless wall look. For flooring, I had a choice of pricy and ugly rental carpet or something I shipped. I chose gray wood-look foam puzzle pieces, which are lightweight to ship, quick to lay, and comfortable for standing for four days. The IKEA stool was purchased and shipped for less than the price of renting a tall stool at the show. I selected Abstracta tables because of their modular structure that allows me to adapt the furniture to various needs in the future. The tables are composed of a series of standard length 1/2" pipes and various connectors. With a tiny bit of familiarity, they take less than an hour to assemble and disassemble on site. All the pipes shipped in one long box, while the shelving for the top shipped in a separate box. Finally, I cut the side panels from extra sheets of foam core and then attached plastic cut outs of my tree branding to the tables, which I think gives a beautiful customization. 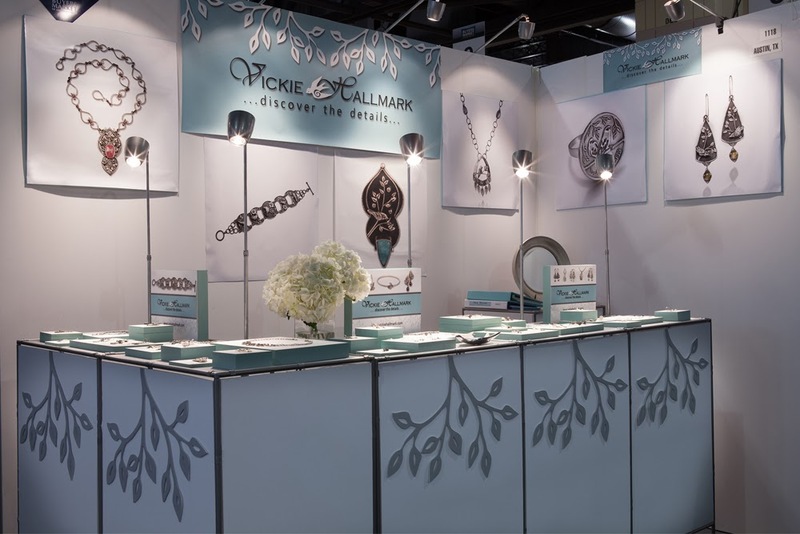 Many hours of work went into designing all of these aspects of the booth, and many dollars were required to purchase all the elements, including lights, signage and jewelry displays. The displays themselves are simple artist boards, primed and ready for painting. I personalized those with my robin's egg blue paint on the sides. 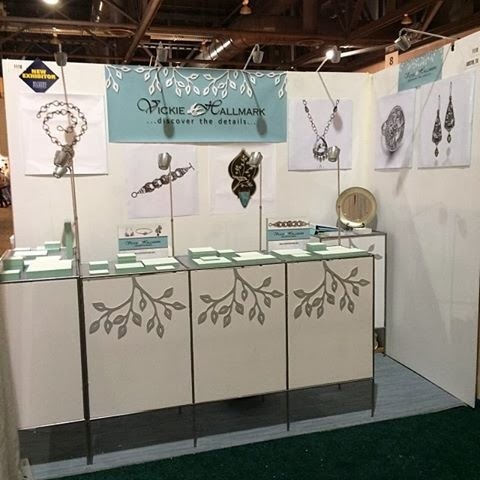 A few extra touches - flowers and a bird dish for business cards - along with the jewelry itself, and the booth is ready for business. I know this was a lot of work, but it is very well executed and I hope that you were very successful! You deserve it! Beautiful and unique. I love your lighting...where did you find the tall lights? Do they clamp anywhere? Lights are from Brightman Designs - they telescope and have clamps, but also attach to Abstracta with S clips. Warning: they are expensive! They were the choice I agonized over the most, before I decided I was in for the long term. They were recommended to me by Gail Lannum. Wonderful post. I have always wondered about the logistics of doing a show a great distance from home. I would love to know if it was worth the money spent for you. Your jewelry is definitely worth the very beautiful booth. Wow! What a gorgeous booth! Congrats on doing the show and thanks for sharing those pictures, what a terrific peak into the process. What a gorgeous and clever booth! Hope the event was wildly successful for you. We are all living through your experience! I've never taken the plunge, and I know that first step you took was a scarey one! I've had two students show there over the years. They seem to like it. I hope you cleared your expenses. At least the initial cost drops as you show in more shows! Thank you so much for sharing your experience! The booth is absolutely gorgeous! Vickie, it was a fantastic learning experience being able to witness all of your hard work firsthand. Your booth was outstanding. I'm rooting for you! Best of luck at the next show and with your wholesale future!